Since I wrote an extended blog post following the last meeting of the Education & Children's Services Committee at Fife Council http://www.kathleenleslie.co.uk/2017/08/education-childrens-services-response.html I have written to the local media and issued a press release - on two topical issues, one of those being the increased provision for early years & staffing shortages. The second being the centralisation agenda of the SNP over the proposed changes to educational governance - something which I believe is about to create a huge democratic deficit, lack of transparency and accountability and will clip the wings of local government across Scotland. 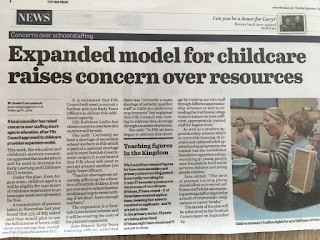 In light of the two strands, I shall pursue this post with a discussion on the changes to early years provision first and then move onto the ongoing centralisation agenda of the Scottish Government. Both of these I have covered in the above link so this post is more just to update readers on what I sent to the media by way of ensuring that the abject failures of the Scottish Government are once again highlighted. From August 2020 children in Scotland from the age of 2 will be eligible for 1,140 hours of free childcare (30 hours per week). A consultation carried out last year by Fife Council indicated that out of 575 respondents, 883 would use the increase in hours - that is a take up rate of 65% and the majority of those stated they would wish to use Fife Council based facilities. Now where does this fit in regards to staffing? To manage this almost doubling of provision the Council has calculated it will require an additional 400-500 Early Years Officers (EYO). Under the current provision (640 hours) there is a total of 1,050 EYOs with 315 of them being supply staff (meaning staff with no contract - read, zero hours contract). 1. If this is from 2 years old is it childcare or learning? Which do we, as a society, believe is correct? Many countries do not place their children into formal eduction until the age of 7. 2. There is no "obligation" to place a child in ELC - but if a parent/carer does not, does this mean their child is "missing out"? 4. This is a blanket scheme - everyone will receive this for free, is that right? 5. What about family? Does 30 hours per week of childcare mean that familial bonds with youngsters will not be as strong? Aside from these considerations the one that I would like answered, and which I asked of the Head of Education Services, is how is this going to be staffed? We are currently in the midst of a national staffing crisis in the recruitment of teachers due to years of complete failure by the Scottish Government to properly address this issue - there are over 4,000 fewer teachers in Scotland than there was a decade ago when the SNP came to power. Education, they claim, is their number one priority - its just a shame that those are empty words, the facts do not corroborate the mantra. Teaching shortages are adversely affecting the educational opportunities of young people across Scotland from primary one through to school leavers. Only recently I spoke to a concerned parent where the school his daughter attends is not teaching an Advanced Higher in a subject that both the parents and the pupil were promised would go ahead. Instead, through a school cluster liaison process the pupil was to attend another school to take up the subject only to find nothing had been put in place and that school was also not teaching the Advanced Higher - due to staffing shortages. Only this week Trinity Academy in Edinburgh, one of Scotland's leading State schools, has issued a plea for two Maths teachers - vacancies, that despite advertising, it has been unable to fill. This is the state of education under the SNP in Scotland. This planned expansion of Early Years provision is all well and good but will there be the available staff? In effect the local authority, in this case, Fife Council, has to do the bidding of the Scottish Government, so it somehow has to find staff as the onus is on it provide the service. This leads me to the second area of discussion for this post. The dismantling of Scotland's regional police forces in 2013 (Police and Fire Reform [Scotland] Act 2012) is a shambolic failure of the SNP Government that we continue with to this day. The one, centralised police force (Police Scotland) has lurched from one crisis to another due to a lack of resources, lack of transparency and an ongoing process of centralisation. This word - centralisation, is what we have with the police and fire service and what we are about to see with education. Any claims that more powers are to be devolved to the local level is utter nonsense. 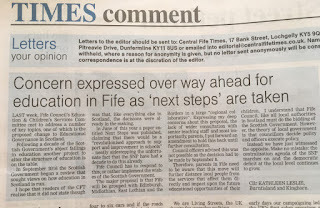 Whilst the "Next Steps" paper of Cabinet Secretary, John Swinney, claims to be a "revolutionised approach to support and improvement in schools" (they have had ten years to do that but anyway...) it is instead, a plan to implement further centralisation by creating Regional Collaboratives - which for Fife will mean it is grouped in with Edinburgh, Midlothian, East Lothian and the Borders, all of whom will feedback to the Scottish Government through Education Scotland (a quango set-up by the Scottish Government). 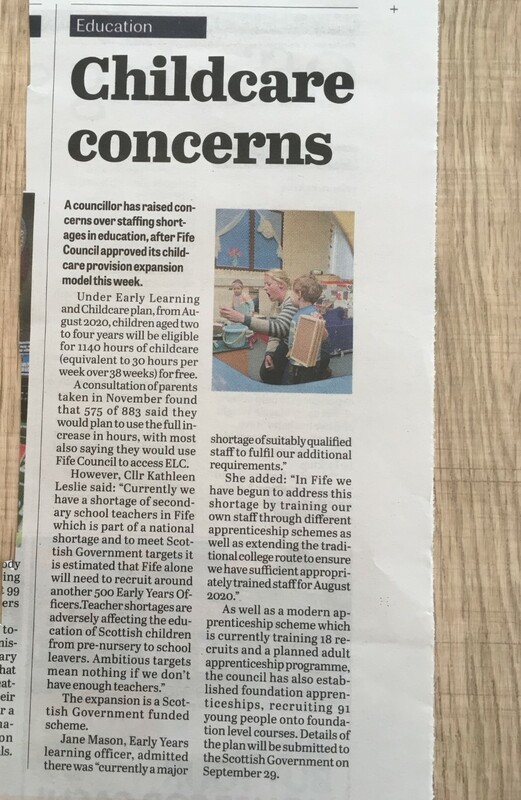 I proposed an amendment at Committee level for this decision in Fife to be put on hold until there had been further consultation with senior teaching staff and parents, however was informed this was not possible as the decision was required 10 days later. Two points need to be taken from this, the first being that, local government, in theory, is that councillors decide policy and officers execute policy - instead we have seen the exact opposite happen. Secondly, that local authorities across Scotland are left in a position now whereby they must do the bidding of the Scottish Government. It is not for them to decide local policy it is from them to implement the wishes of the SNP at Holyrood, no matter how local councillors or local people feel. Centralisation of all decision-making in Scotland has been the theme of this Scottish Government now for a decade and the result of it being that there is a gradual erosion of local authority input. Whether it be the disassembling of regional police forces or the creation of education regions, the message is clear - it is not about power being devolved but rather power being grabbed and held onto by a tight leash from a central point - the SNP Government at Holyrood. 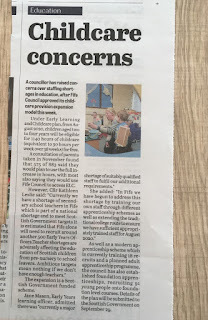 My comments on the expansion of the Early Years & Childcare proposals appeared in both the Fife Free Press and the Fife Herald and my letter on centralisation was printed in the Fife Herald, Central Fife Times, Glenrothes Gazette and the Fife Free Press. Last week, Fife Council’s Education & Children’s Services Committee met to address a number of key topics, one of which is the proposed change to Educational Governance in Scotland. Following a decade of the Scottish Government’s abject failings in education another project to alter the structure of education is on the table. In September 2016 the Scottish Government began a review that sought views on how education in Scotland is run. What it did not state though was that, like everything else in Scotland, the decisions were already in the making. 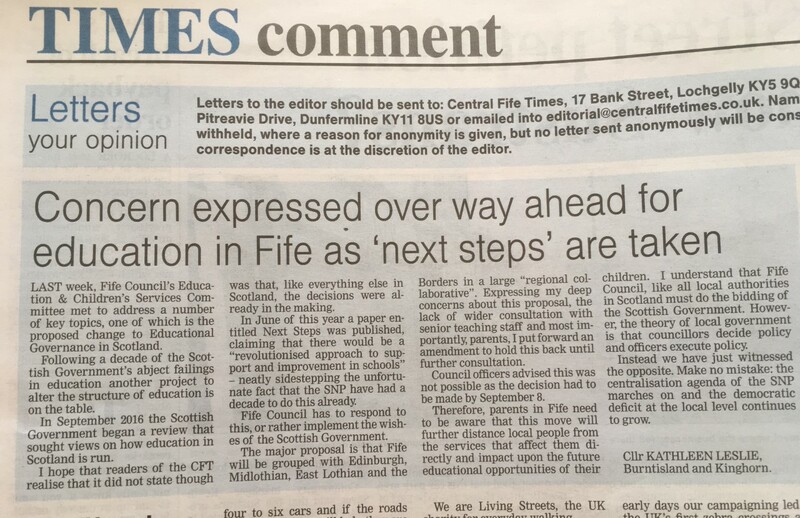 In June of this year a paper entitled Next Steps was published, claiming that there would be a “revolutionised approach to support and improvement in schools” – neatly sidestepping the unfortunate fact that the SNP have had a decade to do this already. Fife Council has to respond to this, or rather implement the wishes of the Scottish Government. The major proposal is that Fife will be grouped with Edinburgh, Midlothian, East Lothian and the Borders in a large ‘regional collaborative”. Expressing my deep concerns about this proposal, the lack of wider consultation with senior teaching staff and most importantly, parents, I put forward an amendment to hold this back until further consultation. Council officers advised this was not possible as the decision had to be made by September 8th. 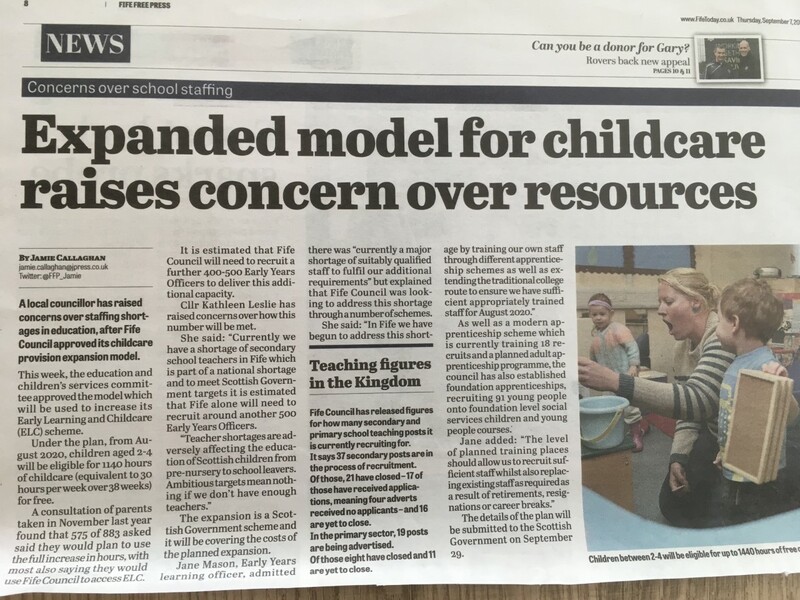 Therefore, parents in Fife need to be aware that this move will further distance local people from the services that affect them directly and impact upon the future educational opportunities of their children. I understand that Fife Council, like all local authorities in Scotland must do the bidding of the Scottish Government. However, the theory of local government is that councillors decide policy and officers execute policy. Instead we have just witnessed the opposite. Make no mistake: the centralisation agenda of the SNP marches on and the democratic deficit at the local level continues to grow.